Three things – 11/20/16: Identity and the election – Elizabeth Anne Wood, Ph.D. This week I’ve ben thinking a lot about identity and the election. No surprise, I’m sure. Identity politics has been at the forefront of many election analyses in the couple of weeks. Racism, sexism, and heterosexism intersected powerfully in this election, and the voting patterns of whites, and particularly of white women without women college degrees, has been given particular attention for good reason. The emboldening of white supremacist groups by Trump’s campaign dog whistles – and his explicitly racist comments – signals a rise of identity politics on the far right at exactly the moment when we on the left are wondering whether we need to focus on economics over identity. I’d argue that we can’t separate economics from identity entirely. Class is identity. Race is identity. Discriminatory policies are often based on ideas about identities and the power and privilege that attach to them. Here are three articles I’ve read that gave me different ways to think about identity in this election. “The End of Identity Liberalism,” by Mark Lilly, criticizes the tendency of we on the left to focus on rights and issues attached to specific categories or communities of people. Lilly, a humanities professor at Columbia University, argues that liberals have lost track of the kinds of broad-based economic and local community needs that unite people across identity-based communities. While there is a degree to which this claim makes sense to me, I think he misses the ways that suburbanization and de facto class and race segregation in our communities have each done more to undermine civic discourse. I also think that Lilly underestimates the importance of identity politics in securing the kinds of fundamental human rights that protect ethnic, racial, sexuality and gender minorities. That said, broad based movements like the labor movement have at times done excellent work to fold those into a broader agenda. We certainly wouldn’t be in this mess if we had a stronger labor movement. “How We Broke Democracy, But Not The Way You Think,” by Tobias Rose-Stockwell on Medium.com, picks up on the identity issue by looking at the way that social media reinforces the fragmentation of audiences – groups of people paying attention to something – by filtering our information according to very micro-level patterns in our social networks. Taken together with the segregation of our physical communities, this online segregation is potentially devastating to cross-community discourse. If we look at the red-county/blue-county divide and see “two Americas,” this analysis actually shows us that there are millions of Americas, and they overlap in ways that reinforce bias and belief, and heighten our tendency to respond with emotion rather than reason. “An Open Letter to White Liberal Feminists,” by Rhon Marigault-Bryant, published on the web site of the African American Intellectual History Society, expresses a mix of disappointment and hope. Marigault-Bryant is a professor of Africana Studies at Williams College, and her disappointment is aimed particularly at those feminists whose focus on simple equality of opportunity in the workplace or in colleges and universities has often rendered invisible the structural racism puts the lives and futures of people of color at risk in ways that are much more fundamental than whether or not they’ll get equal pay at their law firm job. Her hope is that, at last, some of those feminists will realize that even their liberal agendas are at risk, but I have to say that in my own years of struggling against liberal feminism’s opposition to many human rights issues that matter to me as a queer socialist feminist, I’m not sure I have much hope. As usual I don’t have answers, but I do know this. Identity is a powerful organizing tool, and communities are certainly affected differently – and targeted differently – based on identity-linked aspects of their members. When people say “we’ve neglected the white working class and their economic anxieties,” they may be implying that members of the white working class are not concerned about identity, but that would be replicating a mistake we make all to often: assuming whiteness as a standard, and class as purely financial. I know one thing for certain: Neither of those things is true. 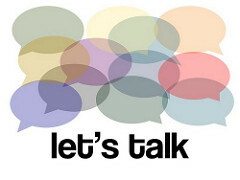 “Lets Talk” conversation bubble image is by Ron Mader on Flickr and used under a Creative Commons Attribution-Share Alike generic license.